The art of sculling well and gracefully is one of the most enjoyable of feminine water-side accomplishments. It can be acquired with comparative ease, provided that the beginner determines to acquire a good style from the very outset. There are, besides, few acquirements more useful than to be able to manage a light skiff with ease and skill, for sculling is a popular and practical mode of travelling by water, and is equally suitable for either lake or river boating. One of the great advantages of sculling is that it can be practised in almost any kind of weather; skiffs, too, are the first boats seen out on the river early in May, and, as a rule, are the last to leave it in late September or October. On days when a stiff breeze is blowing, one sees at least half a dozen skiffs to every punt or canoe, and those who live by the water-side all the year round, to say nothing of the holiday visitors inhabiting the pretty rose-covered cottages and bungalows, with their gay, flower-decked lawns running down to the water's edge, not only visit friends living some miles away up or down stream, but travel to and fro in skiffs to all. the local regattas, and even go to church in them on Sundays. The more athletic feminine votaries of boating will enjoy handling the sculls themselves. The allied and indispensable art of steering a skiff must not be neglected, however, and may with advantage be made a matter of special study by girls who, though too delicate to row, are often in request to sit in the stern and "cox" a boat. It is a great mistake, where feminine sculling is concerned, to overload the skiff with passengers; the consequence is that the boat lies dead on the water, and strained muscles and blistered hands follow prolonged efforts to propel it. The most pleasant of all forms of sculling is undoubtedly that in which two are sculling, with another to steer, and many miles may thus be covered without undue fatigue in the course of a long day's outing. Where a short journey is in question, however, two passengers might be taken in a single sculling skiff, and three, or even four, in a double-sculling one. I A where feminine sculling is concerned, and it is absolutely essential that a stiff-brimmed hat of a moderate size should be worn which can be firmly fastened to the head without any chance of its flopping up and down. Flying ribbons and sashes and dainty muslin frocks are quite out of place when sculling is the occupation of the moment. Most girls wear a becoming yet workmanlike kit, consisting either of a simple linen or cotton frock in some attractive colour, made in some simple fashion, to allow full freedom to the arms, or of a blue serge skirt and well-fitting white lawn or muslin blouse with a neat stock collar. Sculling and blisters have a painfully intimate connection in the minds of most people, and the would-be sculler should remember to remove any rings before beginning to scull, or most painful blisters will result. It is an excellent plan, also, to harden the palms of the hands for a day or two before the first sculling lesson, either by rubbing them several times a day with powdered resin or by bathing them frequently in cold water in which alum has been dissolved. A little dry yellow soap rubbed on the palms of the hands before beginning to scull is another good preventive of blisters. The best way for the novice to begin learning to scull is to hire a strongly built single-sculling skiff which will not upset, and persuade a competent friend to sit in the stern and steer and act as coach. When she has acquired the rudiments of pulling both sculls through the water equally, and of feathering them, she may learn how to step properly into a lightly built boat, and the sculling will seem easy. For the first lesson, having made one's way to some unfrequented spot during the early hours of the day, when few other craft are likely to be about, it is best to tie up, or unship, the rudder, so as to learn to pull with equal strength with the two sculls, thus steering a straight course without outside help, as the constant use of the rudder necessarily takes some way off the boat; indeed, the less it is used the better. It should be reserved to assist in keeping an even course when negotiating the bends of the river, to help the oarsman to avoid collision with other craft, or to turn the boat. It should not be used to correct a zigzag course caused by uneven pulling at the sculls. 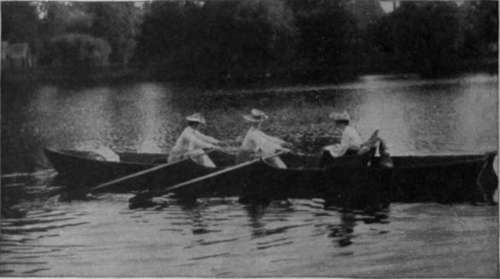 Having seated herself on the narrow central seat in the skiff, facing the stern of the vessel, the sculler must see that the footboard - or stretcher, as it is called - is in the right position, which is as short a distance from the sculler as is compatible with clearing the knees with the sculls during the swing of the body in the stroke. Always sit exactly in the centre of the seat, and cause the "cox " to do the same, in order to "trim" the boat - that is, to allow it to float level on the water. Sit square and straight, with back erect and feet pressed firmly against the stretcher, heels close together and toes wide apart. The head must be kept well up, and the eyes must look straight ahead when sculling.